If you love architecture, if you love history, and/or if you love castles in Europe, you may want to never leave this castle. The first thing you should know before your visit is that this Castle is huge. It's so big, that its various sections have their own unique individualized tours. This is because over the years that has constantly grown. First constructed in the 13th century in Gothic style Page received a Renaissance makeover end 16th century and in the 17th and 18th century was again refreshed by Baroque and Rococo styles. Tour 1: Starting from the IIIrd Courtyard of Cesky Krumlov Castle, takes you inside the castle's Renaissance and Baroque area such as Saint George´s Castle Chapel, Eggengerg Hall, and the Masquerade Hall. Tour 2: Focuses on the Schwarzenberg family history - the Schwarzenberg Portrait Gallery, the lifestyle exhibit in the 19th century Suite and the Suite of EleonorazuSchwarzenberg. Baroque Theatre: The exquisitely lavish theatre is among the best preserved of the period and the tour shows you the complete inner workings of the stage shows - auditorium, orchestra pit, stage technology, machinery, costumes. Hradnímuzeum: In a beautifully appointed room, check out the precious artifacts from the Castle depositories and how they relate to the nobles who lived here. Castle Lapidarium: Once, these cellars served as stables, for possibly a hundred horses. Now, they preserve and exhibit the collection of priceless statues at the castle including those from the Cascade fountain. Castle tower: This 6 story high structure is the city's landmark. After The Climb lyrics Beautiful lower levels you can get to the top for the finest views of the city. Bear Moat: There are literally bears living in this moat. Check out the castle souvenir shop. Be 10 minutes early for your tour. Remember to take breaks between extended tours. Detailed price lists for tours of the theatre, museum, lapidarium, tower, cellars, and garden can be found on the attraction website. Admission free to Castle Garden, Cellars and Bear Moat. There are no guided tours on Monday. Closed on Mondays from November to March. 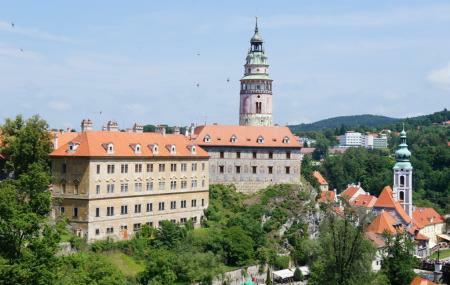 How popular is Cesky Krumlov State Castle? People normally club together Plague Column and Latran Houses while planning their visit to Cesky Krumlov State Castle. Very well kept castle in a picturesque old town. Beautiful views of the old town from almost every part of the castle grounds. Was reasonably busy in March so must get overly busy towards the summer months. Everything seemed to be getting kept neat and tidy and well maintained. Beautiful castle located in a lovely medieval-looking small town. I recommend coming during spring when it's not terribly crowded. Definitely recommend! I really loved this place, you can just walk around the castle all day. The sunset near the gardens was beautiful casting warm light on the city below. To visit the Castle and town is like taking a step back in time of at least a hundred years.The Soviet border was very close to the town, and locals tell of viewing the fences as like looking at the very edge of the known world !....so much for communism. Theres nothing not to like the locals love the tourists visiting, there no end of photo opportunities, restaurants and bars are plentiful and prices are about the lowest you will find in that part of the tourist world. Great place for a weekend stay. Many activities, great for taking photos. Even better than the Prague Castle.